This feels great. I no longer have doubts about reaching my goal weight. I’ve ridden my bike less than two miles over the past five days, but by controlling my diet carefully, I’m still losing weight. I’m not giving up on the bike. I actually feel the need to get back on it. One of the issues I’ve run into in the past is that all of my social activities involved food. I’m trying to change that. I also seem to have given up beer without even noticing. I just told myself I’d rather lose weight that buy beer, and after enough times of thinking that, I no longer found myself wanting beer. I’m not going too far that direction either. I’ll still drink for special occasions. I’m going to restart my push-up plan on Monday. I did the “test” last night and manged 15 push-ups, which is better than before. I don’t just want to be thin. I want to be toned, strong, and healthy. 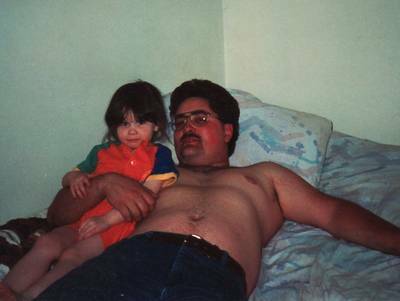 Just for fun, I’m including a picture of me and my daughter from May of 1995. I was overweight then, but I certainly wasn’t morbidly obese. I don’t know what I weighed, but I wish I had never gotten bigger than that. I was 24 in that picture, my daughter was three.